A 73-year-old Caucasian man presented for evaluation of a one-month history of painful, pruritic rash across his lower abdomen and lower back. Two years earlier, he was diagnosed with stage IV invasive colorectal adenocarcinoma with multiple hepatic, pulmonary, peritoneal and osseous metastases. He had previously undergone surgical excision of the primary mass in his colon, chemotherapy with multiple drug regimens and radiotherapy to his right hip. At the time of presentation in our clinic, the patient had been treated with Lonsurf®, a combination of trifluridine (a thymidine based nucleoside analogue) and tipiracil (a thymidine phosphorylase inhibitor), for one-month duration. 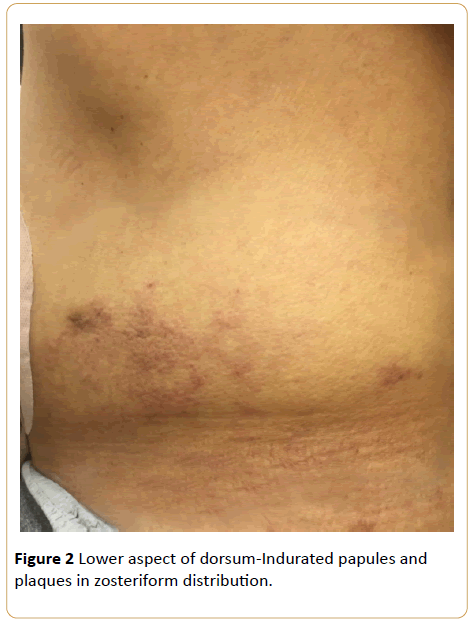 A 73-year-old Caucasian man presented for evaluation of a one-month history of painful, pruritic rash across his lower abdomen and lower back (Figures 1 and 2). Two years earlier, he was diagnosed with stage IV invasive colorectal adenocarcinoma with multiple hepatic, pulmonary, peritoneal and osseous metastases. He had previously undergone surgical excision of the primary mass in his colon, chemotherapy with multiple drug regimens and radiotherapy to his right hip. At the time of presentation in our clinic, the patient had been treated with Lonsurf®, a combination of trifluridine (a thymidine based nucleoside analogue) and tipiracil (a thymidine phosphorylase inhibitor), for one-month duration. Figure 1: Lower abdomen-Indurated papules and plaques in zosteriform distribution. Figure 2: Lower aspect of dorsum-Indurated papules and plaques in zosteriform distribution. Physical examination revealed multiple dark-pink, pruritic, indurated papules and plaques in a zosteriform distribution along the lower back and lateral abdomen bilaterally. The patient denied having a previous history of eczema, psoriasis, hypersensitivity reactions, blistering skin diseases or other cutaneous conditions. He has no known history of food, drug or environmental allergies and denied recent exposure to new detergents, lotions, soaps and other irritants. Four-millimeter punch biopsies were obtained from the right lower abdomen and lower back for histologic analysis. Both specimens revealed adenocarcinoma in the dermis, consistent with metastatic colon cancer, extending to the tissue edge (Figures 3 and 4). Figure 3: 10x H&E stain of 4-millimeter lesion punch biopsy- Foci of tubular adenomatous gland. 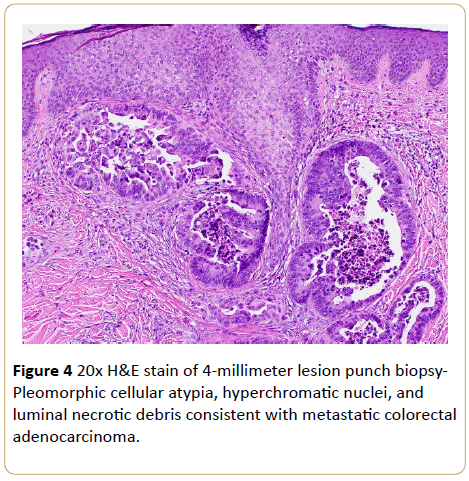 Figure 4: 20x H&E stain of 4-millimeter lesion punch biopsy- Pleomorphic cellular atypia, hyperchromatic nuclei, and luminal necrotic debris consistent with metastatic colorectal adenocarcinoma. The patient was referred to his oncologist for further treatment consideration in the context of cutaneous metastatic disease. He was continued with trifluridine/tipiracil therapy and received additional radiation treatment to the back and abdomen. Two months after our diagnosis, the plaques on the abdomen and back significantly improved. Cutaneous metastasis of primary internal malignancies is an uncommon occurrence. Incidence is highly variable, occurring in between 0.2% to 10.4% of cancer patients . Metastatic colorectal cancer has been estimated to metastasize to the skin in 4% to 6.5% of cases and presents, on average, within three years of initial diagnosis . Cutaneous metastases tend to be found in close proximity to their primary internal site. The lower abdomen and groin are both very common locations for metastases of colorectal adenocarcinoma to appear . Other common sites of metastatic involvement of colon cancer include the neck, head and upper extremities. Our patient also had metastases to his lower extremity, which is unusual. Spread of malignancy from internal sites to the skin may occur via several mechanisms such as hematogenous spread or lymphatic seeding, contiguous tissue invasion or iatrogenic transfer of cancerous cells, as in during surgical resection of tumors. Hence, postsurgical incision scars are also sites of cutaneous disease, resulting from direct transfer of cancer cells and/or lymphatic dissemination . Morphologically speaking, metastatic carcinoma of any type can have a variety of presentations. The typical presentation is a firm, mobile violaceous nodule; there may be just a single nodule or multiples in clusters . Other presentations include lesions that are similar in appearance to neurofibromas, epidermal cysts, and lipomas . A review of the current literature reveals there are relatively few cases of reported zosteriform cutaneous metastasis. Other than primary skin cancers such as melanoma and squamous cell carcinoma, zosteriform metastases have been found with primary breast, ovary, bladder, renal, prostatic, gastric and lung cancer [1,4]. Zosteriform metastases may also be secondary to a Koebner-like reaction at the site of previous herpes zoster infection (Ã¢ÂÂlocus minoris resistentiae’-site of lessened resistance) . It is important to have a high index of suspicion for and recognition of any new or changing skin lesions in patients with active cancer diagnoses or history of disease. In general, the presence of cutaneous metastases typically indicates advanced disease, as was established in our patient, and therefore forecasts an unfavorable prognosis. The present literature shows that survival after diagnosis of cutaneous metastasis can range from one month to three years, with average survival around 18 months . Therefore, it is crucial to biopsy all suspicious lesions and initiate prompt management accordingly to control cancer spread in order to decrease patient morbidity and mortality, and in some cases, for palliative reasons. Dr(s) Chao and Curiel-Lewandrowski had full access to all of the data in the study and take responsibility for the integrity of the data and the accuracy of the data analysis. Acquisition, analysis, and interpretation of data: Krase, Chao. Drafting of the manuscript: Krase, Chao. Critical revision of the manuscript for important intellectual content: Krase, Chao, Curiel-Lewandrowski. Administrative, technical or material support: Krase, Curiel- Lewandrowski. Schwartz RA (1995) Cutaneous metastatic disease. J AM Acad Dermatol 33:161-182. Hashimi Y, Dholakia S (2013) Facial cutaneous metastasis of colorectal adenocarcinoma. BMJ Case Rep.
Nesseris I, Tsamakis C, Gregoriou S, Ditsos I (2013) Cutaneous metastasis of colon adenocarcinoma: case report and review of the literature. An Bras Dermatol 88: 56-58. Rao R, Balachandran C, Rao L (2010) Zosteriform cutaneous metastases: A case report and brief review of literature. Indian J Dermatol VenerolLeprol76:447. Lookingbill DP, Spangler N, Helm KF (1993) Cutaneous metastases in patients with metastatic carcinoma: a retrospective study of 4020 patients. J Am Acad Dermatol 29:228-236.